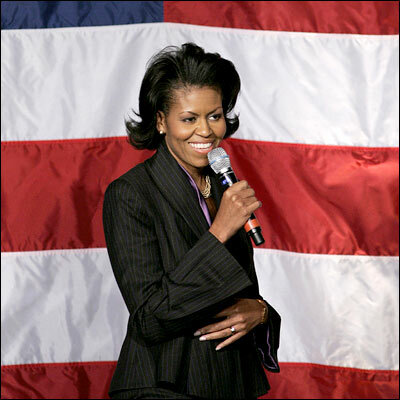 The National First Ladies' Library proudly welcomes Michelle Obama as our next First Lady. Michelle Obama's biography, by Carl Sferrazza Anthony, can be read here. Another biography, from the Obama campaign website, along with a video clip, can be found here. Also, the White House website provides additional information about Michelle: her White House biography and the Blog, an up-to-date account of happenings found on the White House website. An interesting article, written by the National First Ladies' Library historian and consultant Carl Sferrazza Anthony, expands on Michelle Obama's role as First Lady. Carl Sferrazza Anthony has also provided a brief history of tours given by presiding First Ladies to First Ladies-elect. Additional information about America's newest First Lady will be forthcoming. Our gift shop now carries Michelle: A Biography by author Liza Mundy. If interested in purchasing, please visit our gift shop. 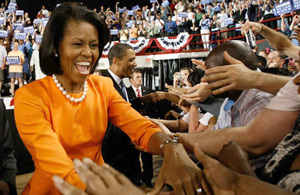 Please see our Newsroom for many additional articles about Michelle Obama.